Despite an awful performance up front, Haskins and co. led the Buckeyes to their seventh win of the season. The 30-14 Buckeyes victory over the Golden Gophers was a lot closer than many predicted, but the good guys still moved up a spot in the AP Poll rankings. Today, we will discuss another big day from Haskins, the battle in the trenches, a mixed performance from the team as a whole, and why we all need to take a deep breath. Every week, I tell myself I will find a different aspect of the Ohio State offense to focus on. And every week, Haskins outperforms expectations. With 412 passing yards and three touchdowns while completing 75% of his passes, Haskins had his best game of the season. He distributed the ball short on 34 of his 44 passing attempts but still gained 280 air yards. The Buckeyes had a season-high seven big plays through the air against Minnesota, including Ohio State’s three touchdowns. While Ohio State struggled to get anything going on the ground, Haskins took control the offense. Do what you want with this data, which can point to either the maturation of Dwayne Haskins or the regression in the run game; maybe it’s even a little bit of both. Another unforgettable performance from Saturday was the play of K.J. Hill. 189 yards and two touchdowns with nine catches was the best individual performance Ohio State fans have seen since Santonio Holmes' 2004 performance against Marshall. Moving on, Haskins looks like he may have to carry the Buckeyes while they figure out their issues. Ohio State is undoubtedly one of the most talented teams in the nation, but their recent play has been discouraging. On both sides of the ball, Ohio State lost the battle in the trenches. Offensively, the Buckeyes’ backfield rushed for less than 100 yards for just the third time in the Urban Meyer era. The trio of Dobbins, Weber, and Haskins gained just 2.9 yards per attempt and lost 30 yards while running the ball (if sack yardage is excluded, this number drops to 11). Ohio State’s quarterbacks were sacked three times, the most this year. On the other side of the ball, Mohamad Ibrahim and co. slashed through the Bucks’ front seven en route to 178 rushing yards. 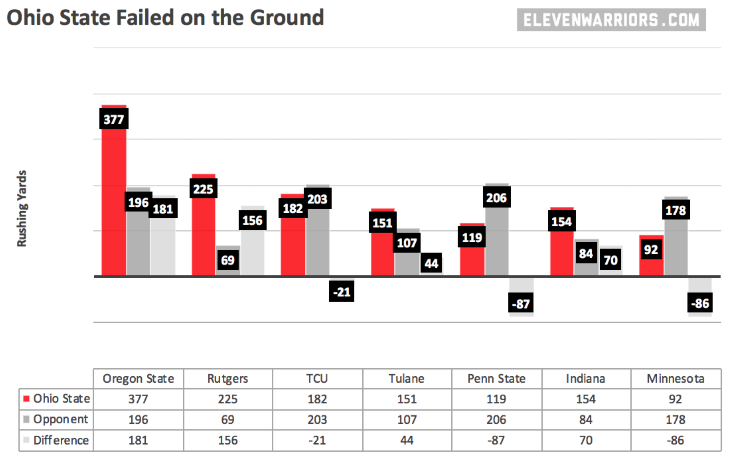 For Ohio State, the difference in rushing yardage was about as bad as it gets. Few positive things can be said about the performance of the front seven. Pete Werner and Tuf Borland combined for 16 tackles but still appeared to struggle. Offensively, right tackle Isaiah Prince had a particularly bad day, allowing all three sacks and accounting for two penalties. Moving forward, the primary concern of this team should be the linebackers and the running game. Isaiah Pryor, the go-to scapegoat for much of the defense’s issues, had a serviceable day, getting his first interception of the season. Pryor still has his flaws, but the criticism of his play must be put on the back burner until more crucial issues are resolved. Ohio State relied on big plays to finish the game on Saturday. The Buckeyes, despite being in the red zone four times, failed to come away with a touchdown while inside the 20. The inability to run the ball is the primary reason for this deficiency, but the lack of effective play calling also stalled the drives. An awful fourth-and-short call following two timeouts, a drop in the end zone, and a big loss on a jet-pass are all unacceptable while knocking on the door. On a positive note, Ohio State won the turnover battle 3-0, the second occurrence of such a margin this season. Isaiah Pryor, Jeffrey Okudah, and Kendall Sheffield all recorded their first turnovers of the year, marking a big day for the secondary. Hopefully, this performance will boost their play for the rest of the year to reclaim their title of Best In America. The Bucks recorded their lowest penalty yardage of the year (35). The unusually clean play from the offense allowed them to record zero three-and-outs for the first time this season. Finally, let’s all take a breath. I have been hard on the Buckeyes recently. As have other writers. As have many fans. Let’s take a minute and realize everything that Ohio State is doing. The Buckeyes are averaging 371 passing yards a game, good for second in the nation. Despite their recent stagnation, the team is still fifth in the country for points per game (46.3). Per ESPN, Ohio State is No. 1 in Strength of Record, a measure of a team’s achievement to this point. They have a tough road ahead of them with the 12th toughest schedule remaining (hardest schedule remaining of those in top ten), but the Buckeyes have proven they can handle tests in even the most hostile environments. Most importantly, Ohio State is undefeated and in the driver’s seat to win its division and make the playoff. The open week is coming. Let’s root for the Bucks to take care of Purdue and make adjustments over Halloween weekend.